I know many Singaporeans are not very fond of meringues because they think of meringues as overly sweet blobs of baked egg whites. I can see where they are coming from especially if they are trying to eat a 5-inch blob of meringue on their own. That happened to my cousin when he chose to order a huge meringue along with his coffee one day while we were at a cafe. He wasn’t one with a sweet tooth so I was surprised by his choice. Perhaps he didn’t know what it was exactly or he was just attracted by the colour of it. Needless to say, I think he only took a few bites of it, leaving most of it behind. I think meringues are best when they come in miniature form – not only do they look more adorable when they are small, they are just about the right portion to taste delicious. 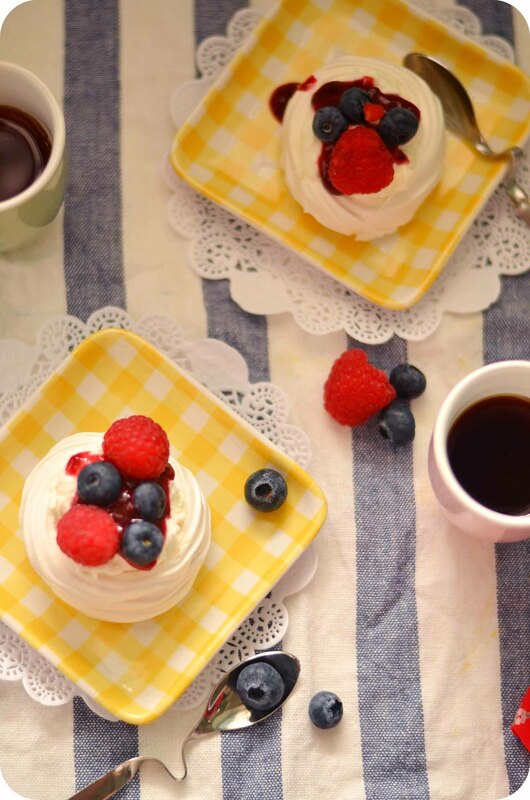 If you are still not convinced about meringues (mini or not), there is one more thing that may change your mind about them – mini pavlovas. Pavlovas make a perfect dessert; it is a delicious end to a heavy, rich meal. The balance in this simple dessert makes it so right, you will have trouble finding fault with it. 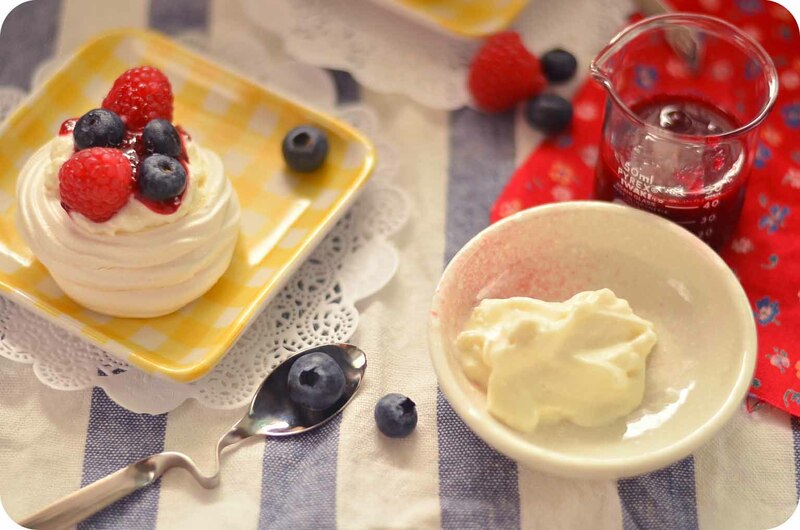 The crisp exterior of the baked meringue giving way to a chewy center, with a luscious smooth cream, usually topped with fresh fruits like berries that counters the sweetness very well. 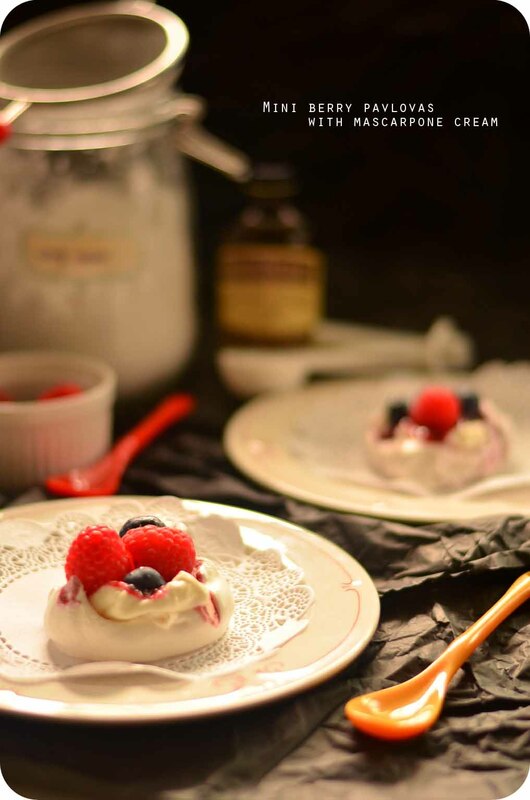 I made a few adjustments to a traditional pavlova – using mascarpone cream instead of chantilly cream, adding a drizzle of raspberry coulis to give it a little more acidity and making them small and easy to eat. These are delicious and pretty yet incredibly easy to put together making them the perfect dinner party dessert. All the components can be made in advanced, and/or multiplied for a big group, and easily assembled at the end of the dinner for an enjoyable dessert. 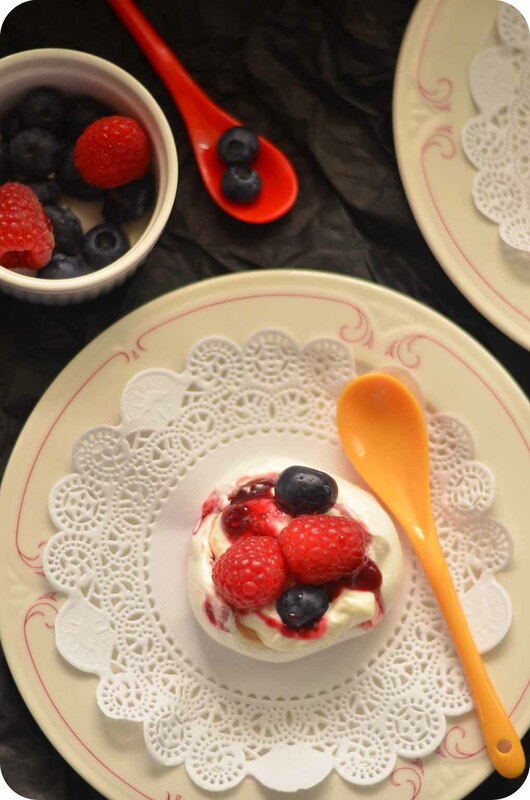 Since these mini pavlovas are so light (after all, it is free from chocolate, butter, starch), your guests will be thanking you for this especially after a huge dinner of roasted leg of lamb, pasta and roasted vegetables. I know that I would be making more of these for a post-dinner treat especially while the berries are still in season. The meringues can be made up to a week in advanced and stored in an air tight container between sheets of baking parchment to separate them. 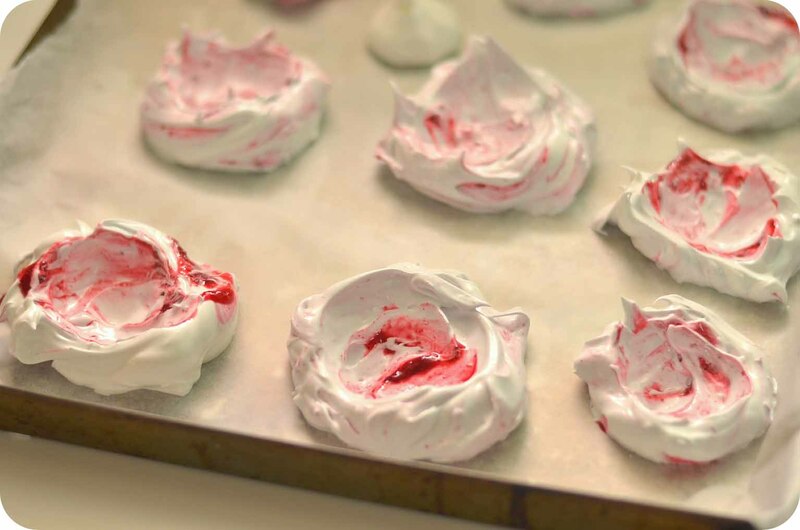 The meringues should remain white as you bake them – if they start to colour (turn brown), your oven is too hot! Turn the temperature down! The texture that you are aiming for is a crispy exterior, giving way to a chewy center when you bite into it. You should eat this dessert immediately once you assemble it as the mascarpone cream will start to soften your meringue. 2. Transfer the warm mixture into a clean bowl of a electric mixer. Using the whisk attachment, beat for about 10 minutes on high speed until you achieve glossy white mixture with firm peaks. Firm peaks are reached when you you see straight peaks when you lift up the whisk attachment and it does not droop back into the bowl. If you are using the raspberry coulis, you can drizzle the coulis on the meringue. Do not fold but simply just scoop or pipe the meringue onto the baking sheet. 3. You can choose to spoon the meringues onto a baking sheet and use the back of a spoon to make a grove in the center or pipe them using a star nozzle. I made both versions. 4. Lower the oven temperature to 100 degrees celcius and bake for about 1 hr 45 mins to 2 hours until crisp and dry. The ones with the swirled raspberry coulis will take a longer time to dry out. You can adjust the proportion of the recipe for the no. of mini pavlovas you are assembling. In this case, it is best to make the amount that you need as this mascapone cream does not keep too well beyond a day or two. 1. Bring the mascarpone to room temperature. Whisk the double cream to soft peaks. 2. With a paddle attachment, cream the mascarpone until soft and smooth. Add in the vanilla extract and icing sugar and mix until well-incorporated. 3. Fold the whipped cream with the mascarpone. 2. Pass it through a blender. Use a fine-mesh sift to remove the seeds/pips. Transfer it to a air tight container and chill it down (it thickens as it cools). You can make this in advance and store it in the fridge for up to a week or freeze it for other uses for up to a month or two. 1. Top the pavlova with mascarpone cream, raspberry coulis and fresh berries. 2. Finish with a dusting of icing sugar if you like. Serve immediately after assembling. This entry was posted in Baking, Desserts and tagged berries, dessert, mascarpone cream, meringue, pavlovas, raspberries, summer, swiss meringue. Bookmark the permalink. Wow this looks so good !!! I love pavlovas and these are gorgeous. 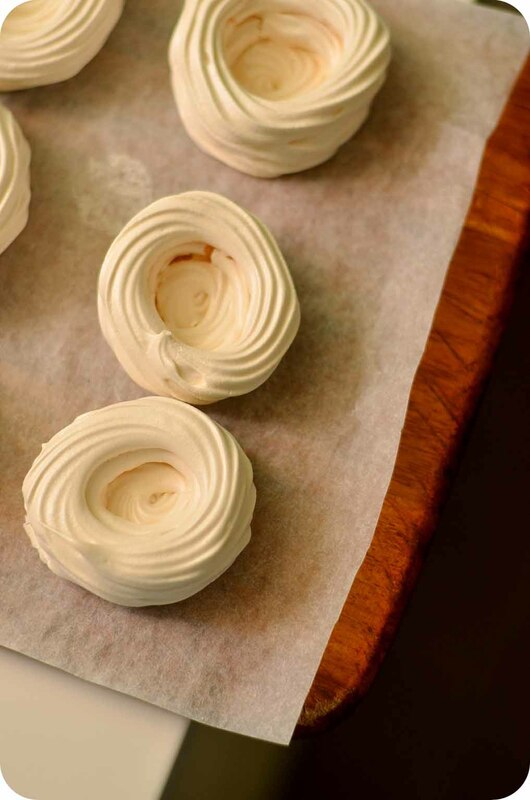 I agree that meringues need a little something extra… and these look perfect. YUM. These are perfectly adorable! 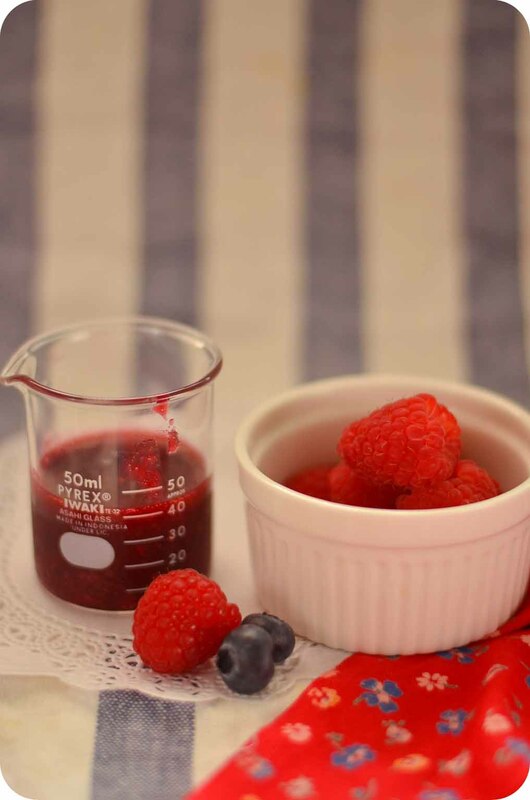 I love the idea of making tiny pavlovas:) I also love your little beaker.. that is so cute! !